Price Drop! Was: $179.95 Now: $149.95. For a limited time only, while stocks last. 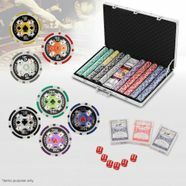 This item is a set of Brand New High Quality 1000 Chip Professional Poker Game Set. This professional Poker Chip Set includes 1000 pcs 13.5 gram professional poker chips , 6 dices , 3 decks of playing cards, 1 dealer button, 5 poker buttons and 1 aluminum case with keylock. Every poker chip is designed with reflection effect under different light angles. Utilizing a high-tech clay composite with a metal core, these poker chips have full color image stickers on both side. Great handfeel and weight, we know they will make your home games even more exciting! The chip size is 40mm in diameter which feels good when you hold them. They make a deeper sound ("pot splash") when the chips are thrown into the pot - that's quality chip. Each chip is made to specifications and is perfectly balanced to give the best effect. This Poker Game set comes in a fantastic Aluminium kit box. You would feel like you're at the casino with these luxurious chips! Play with your friends or family and enjoy the fun of poker! "Little Blind" "Kill" "Big Blind" "Reserved" "Missed Blind"